since I stripped the straw protection off those I’d left outside. 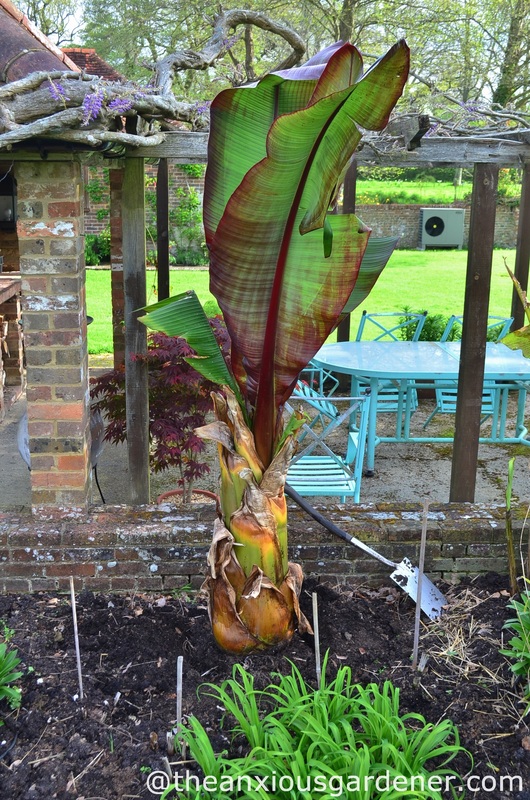 and hefty red bananas (Ensete maurelii). Hardly any time at all since I manhandled this particular fellow into position. Well, two of us manhandled. But all that was months ago – way, way back in April. 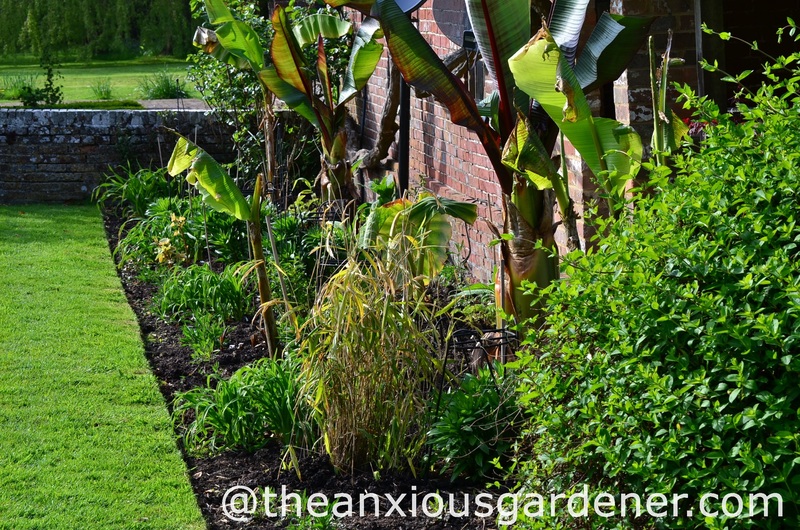 Spring was very mild this year and I gambled on getting the tropical border under way earlier than usual. (Frosts are common at the Priory during April and even into early May). 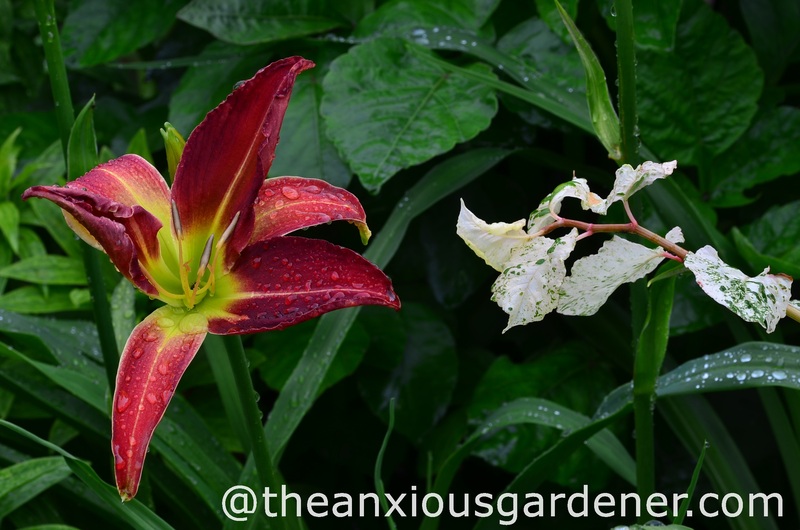 The gamble paid off – we had no late, hard frosts and by the end of May, daylilies, cannas and dahlias were pushing through a thick, compost mulch. A mulch which I had generously scattered with pelleted chicken manure. By early June, spider daylilies were blooming, including ‘Stoplight’. But overall the bed was still fairly sparse. Tropical borders are late starters. A month later and it had plumped up a bit. 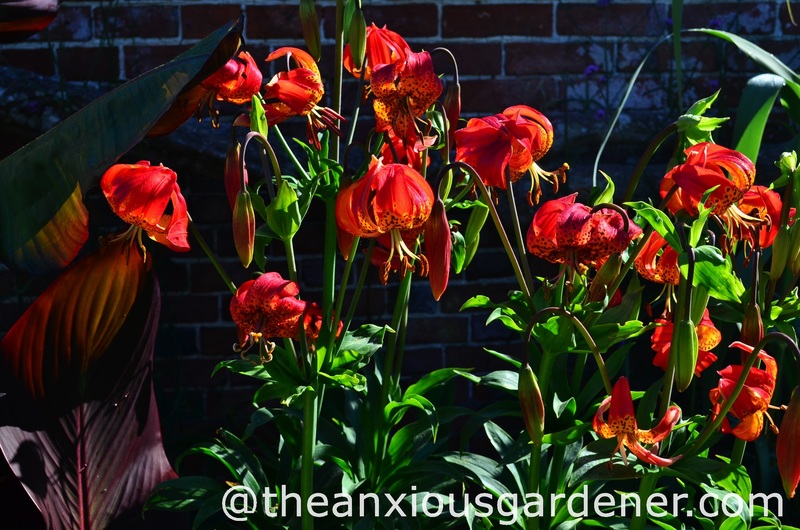 They flower for several weeks, look rather exotic and so sit well in this border. I like them a lot … but not enough. I shall remove them in the autumn. As pretty as they are, they’re a martyr to lily beetle. However many red beetles and ghastly grubs I picked off, later on they became infested; tatty, yellowed and horrid. Some plants simply don’t make the grade. But then this a learning curve for me; I find out what works by experimentation. Sometimes disappointing experimentation. 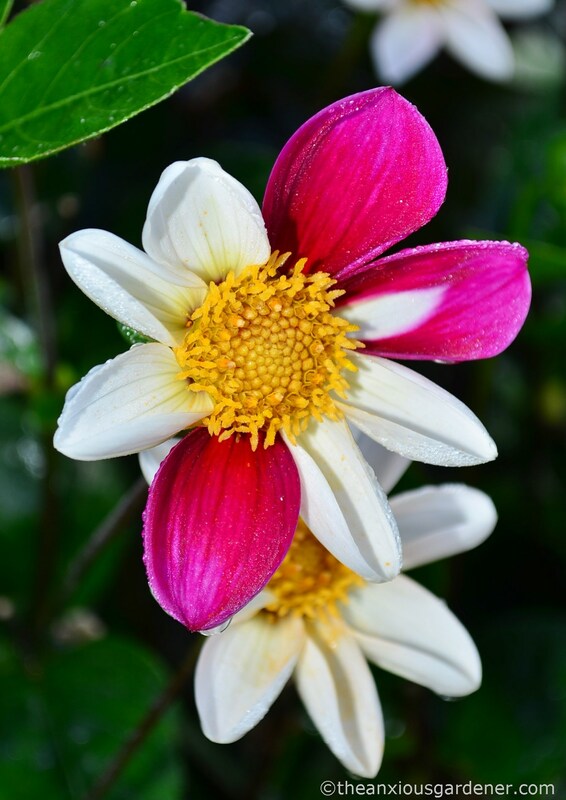 Unlike the lilies, Dahlia ‘Twyning’s Smartie’ most certainly does work and has earned itself a regular centre-stage spot. The biggest, this one, was left in the ground over-winter, heavily mulched. All the dahlias left in the ground performed better than those I lifted, stored and replanted. ‘Twyning’s Smartie’ produces a staggering amount of flower – each one different. It is a reliable, non-stop stalwart, thuggishly shouldering to the fore. Mid July and another star performer has entered the fray – Dahlia ‘Bishop of Llandaff’. Regular dead-heading should ensure flowering through to the first frost. 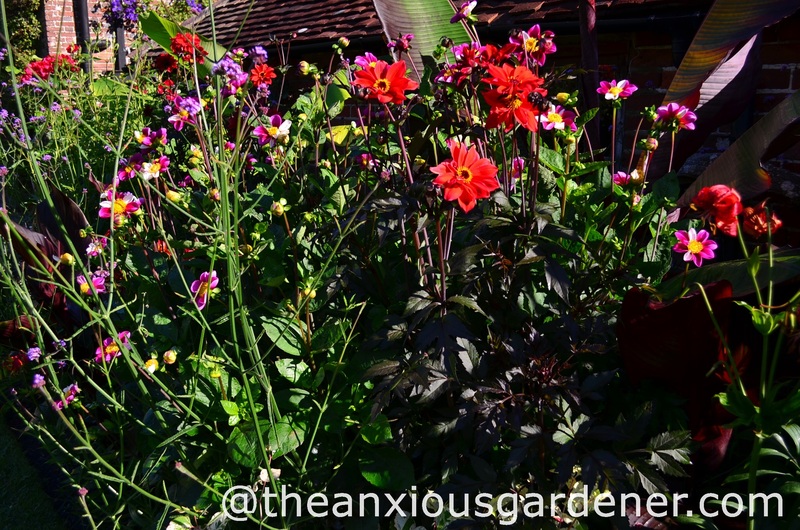 With two dahlias performing so very well, I’m hoping for a third. I’ve added another to the mix – D. ‘Twyning’s After Eight’. Though still small they’ll make a bigger impact in 2015. Incidentally, I only grow single dahlia varieties. I do like some of the ball and cactus forms but bees and butterflies don’t. Also by July, and at long last, my bête noire – those satellite dishes – were obscured, if only partially. Thank you tropical border. Thank you so very much indeed. 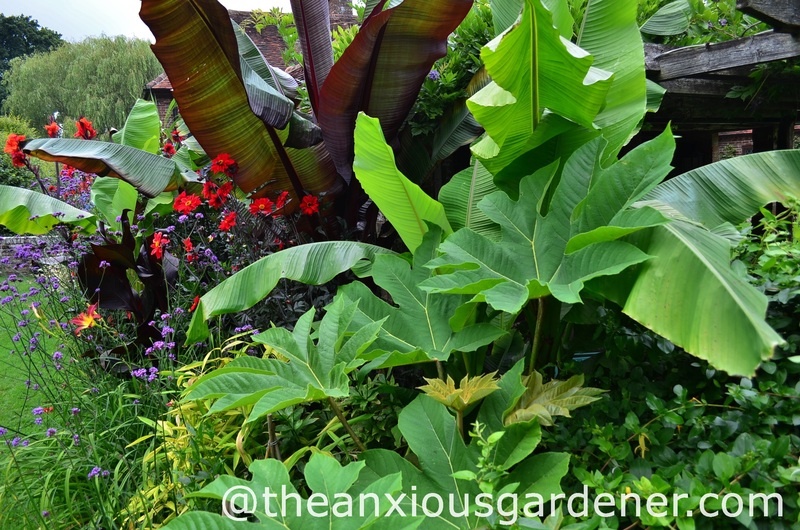 Early August and Canna ‘Red King Humbert’ and red bananas add height and dark foliage. Arundo donax – the Spanish reed – adds yet more height, but produced fewer canes than I wished for. 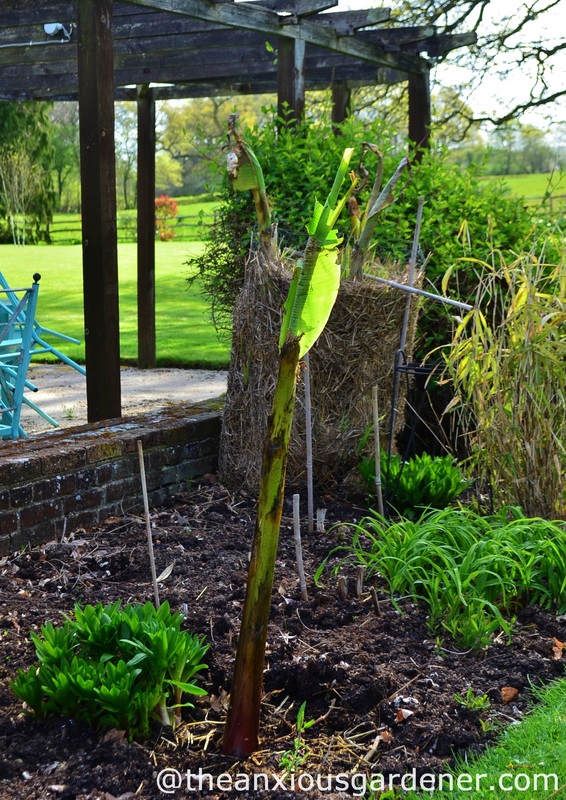 I have two of the variegated form (Arundo donax ‘Variegata’) – though you can’t see them. They are at the back and only a couple of feet tall. I can dream that they’ll tower next year. 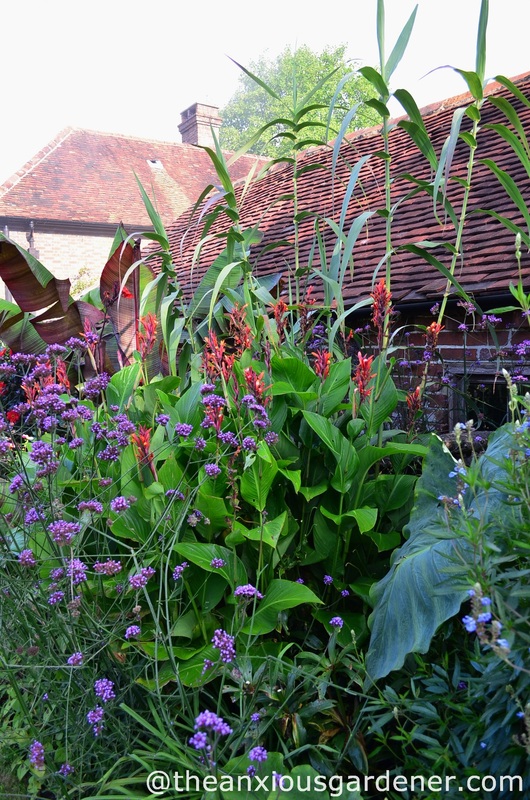 Canna coccinea is a brilliant plant. Hardy, handsome and stout enough to stand without support (which is all any one of us can hope for). I have one big clump and it really should be spilt. But I’ll struggle to find space for the new plants. I only have so much room. I will however always find space for Salvia uliginosa. If you don’t grow it, please explain why. You really should. I adore it. 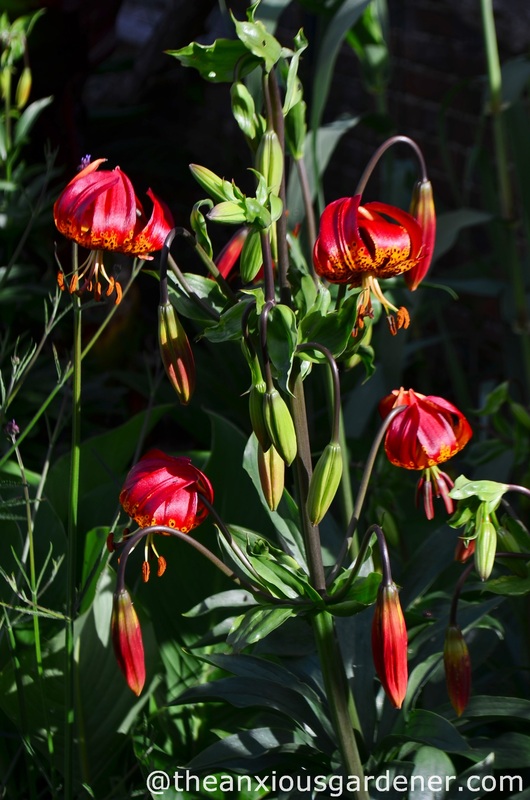 Though hardly exotic, it flowers for months, doesn’t need dead-heading and grows to six or seven feet. Did I mention that I adore it? Even if it does need staking. Bees love it too. But it isn’t necessarily hardy, at least at the Priory. I lift and store mine in the cold frame. I feed and water prodigiously but I’ve read online that it is happy in a dry garden. Which considering its common name, bog sage, I find surprising. Most sources suggest propagation by cuttings but I find the easiest way is simply to divide the root ball. 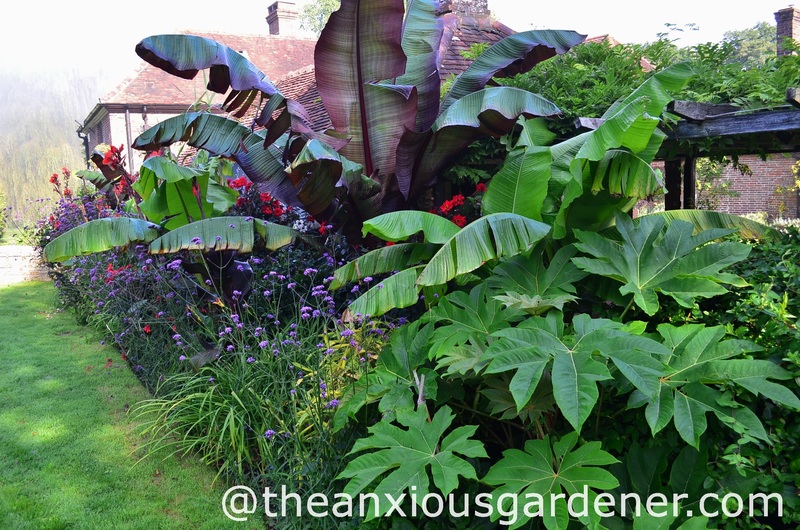 There are some big foliage plants in the border: Tetrapanax papyrifer ‘Rex’ is putting out bigger leaves each year. I like ‘Rex’ but it does sucker like crazy. In a confined space this can be annoying although you’ll have plenty of presents for friends. It does fine in pots and is hardy enough to leave out over winter. There are also two Melianthus major plants here – though you can’t see them. They are toward the back and completely swamped. I’ll pull them forward next year. And the colocasias haven’t made much of a statement either – they too are towards the rear. 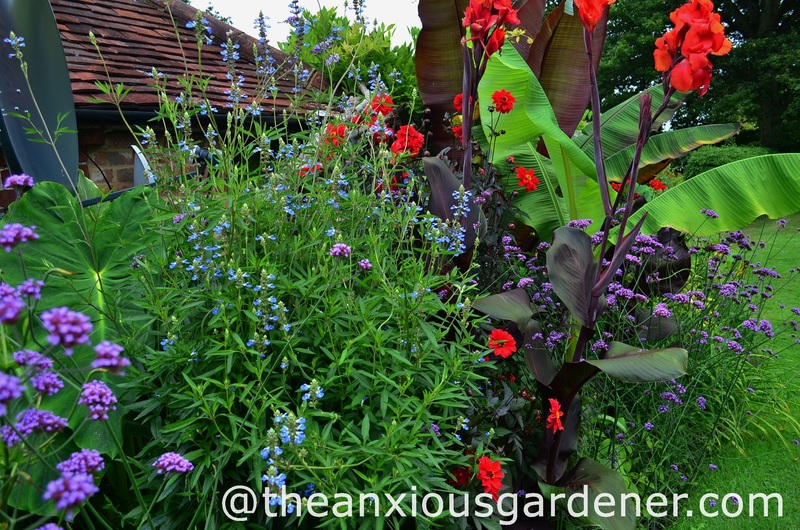 I’ll need to re-tinker the planting – as I do every year. 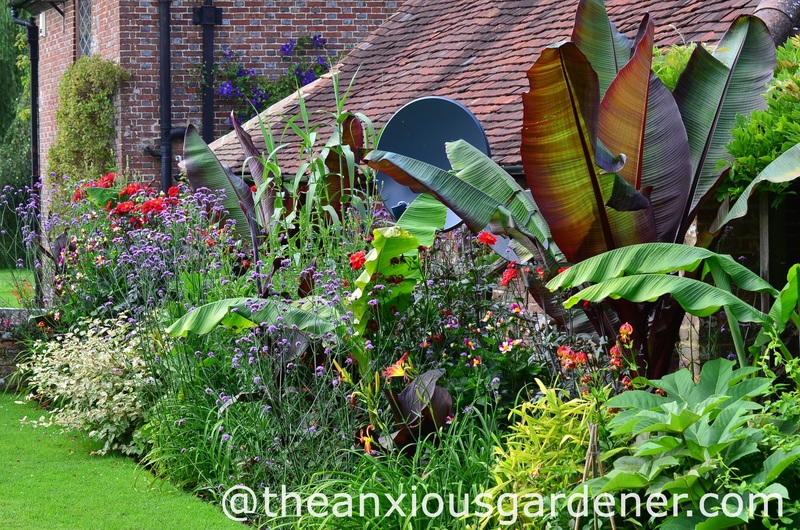 There is no denying that a tropical/exotic border is a lot of work. 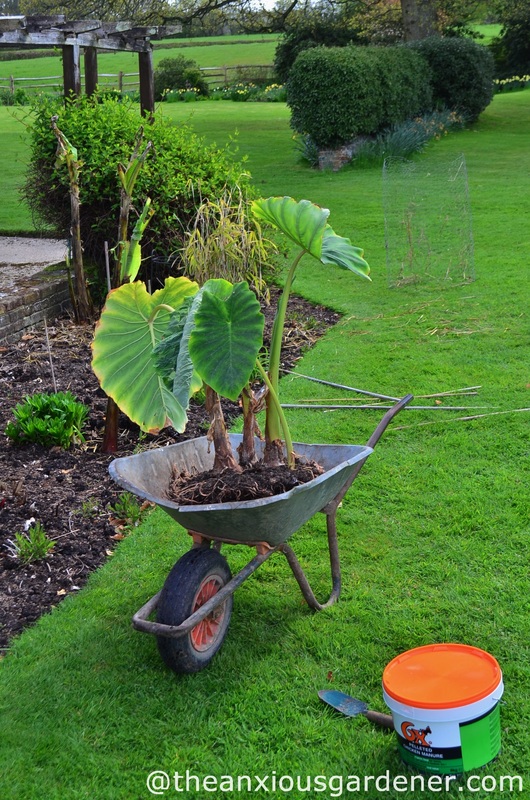 Large, non-hardy plants must be planted out in spring and dug up again at the end of the season. 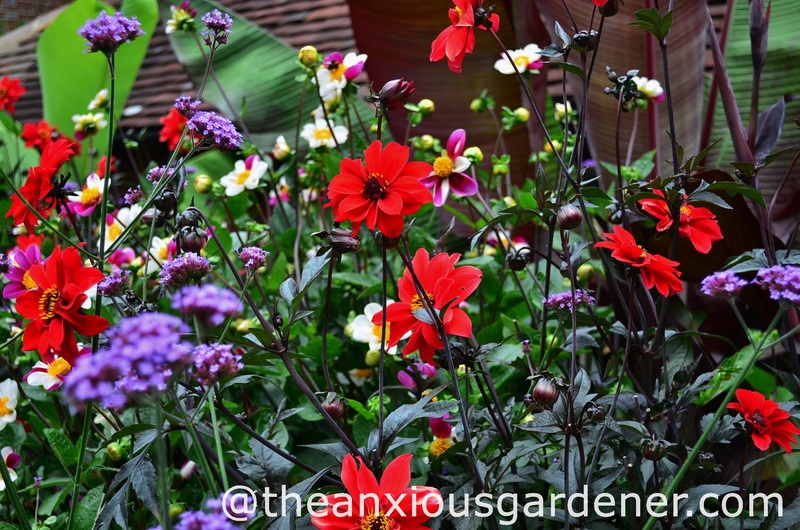 Dahlias will flower dementedly – if you deadhead. Enormous Amazonian leaves will unfurl – if you feed. 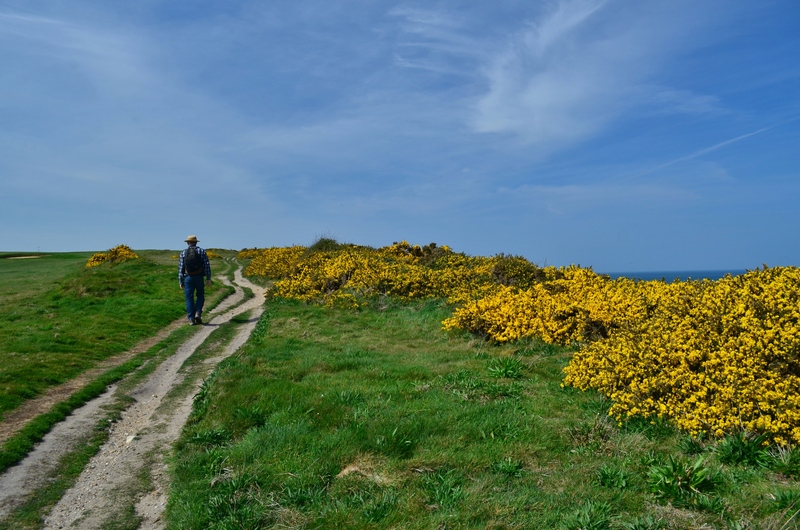 The border will look lush – if you water. But I’ve had it with hour upon hour of watering. Next year, I shall criss-cross soaker-hose throughout the bed. 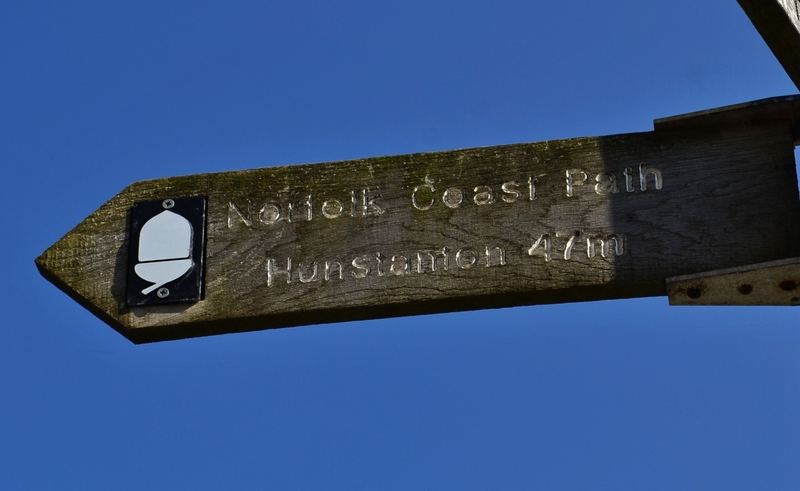 Such an obvious solution – and a little worrying that it hadn’t occurred to me before. Hurricane Bertha proved that some of my staking was inadequate. My friend Jill (who tended the gardens whilst I was away in Germany) had to single-handedly hoist huge, flattened plants back upright and lash them to posts. She did a marvellous, heroic job. Thanks Jill. 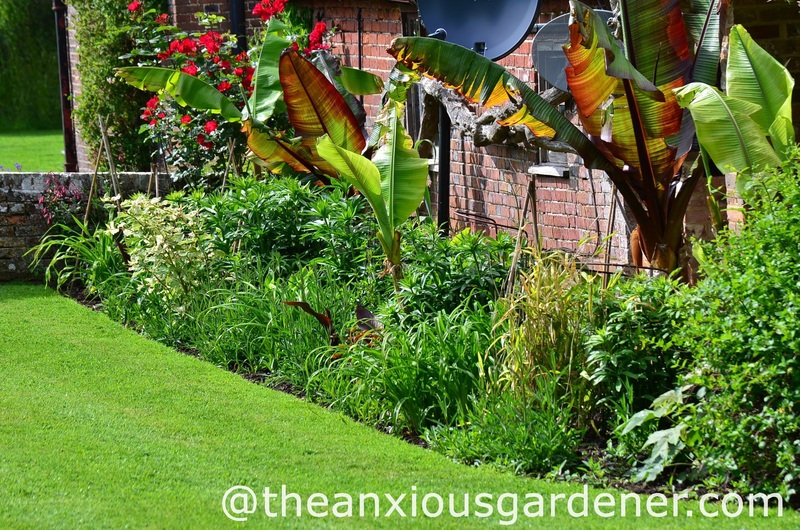 If you want to grab a visitor’s attention; if you wish to be enthralled by enormous jungle plants; if you long for lush green and outrageous colour for several months, then do try a tropical/exotic border. 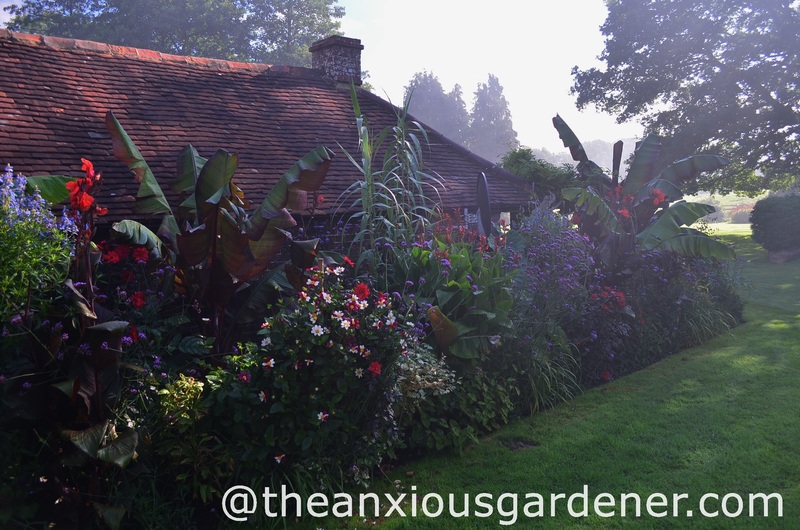 I can’t think of any other part of the gardens that gives me quite so much pleasure. Absolutely beautiful, my family’s been unable to look away. I’m wondering how many of the Dahlia “Bishop of Llandaff” you have in there and do you plant them singly or in groups. Would you mind telling? Love it. Gloriously in-your-face, and yet still tasteful, not an easy trick to pull off! 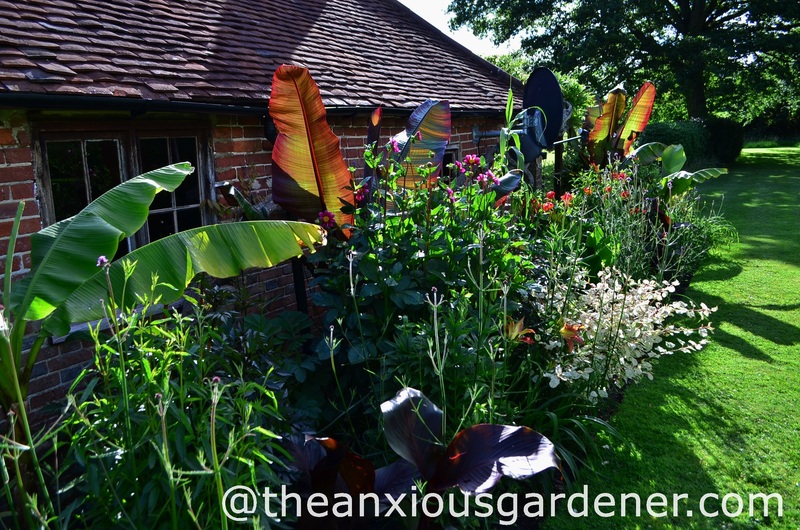 Though the work involved makes me shudder… I suppose one of the advatages of having to dig so many of the plants up each year is that it makes it easier to re-arrange things, and its certainly going from strength to strength. I like ‘Smarty’, and ‘Bishop of Llandaff’ is a longtime favourite. I bought tubers from Peter Nyssen this year and they were excellent. I’m appalling at gauging space at the best of times, which is why I seem to spend so much time moving plants around. I tend to comfort myself with the thought that close planting of perennials is very “now”. I like being happily deluded. 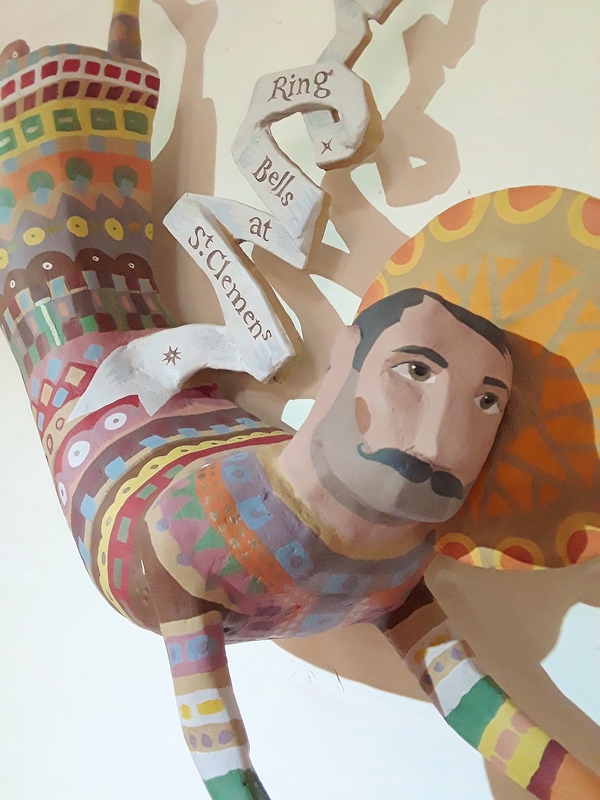 A HUGE effort with a HUGE reward as it does look positively splendid. Bravo…good job! That looks amazing David. Love the way it develops year on year. 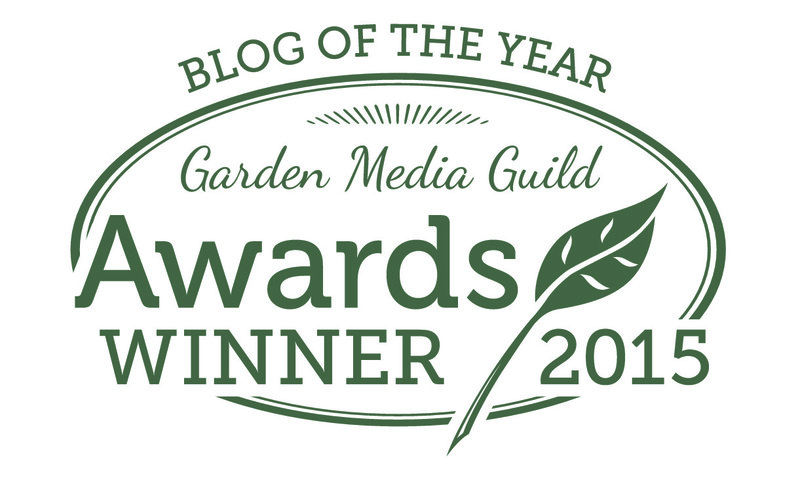 Mine is only in its first year – although I have had the plants for longer in some cases, and I agree with you when you say “I can’t think of any other part of the gardens that gives me quite so much pleasure” I look at my patch and go “you are bonkers, but I love you” Although heaving it all into the greenhouse …. well thats another matter! 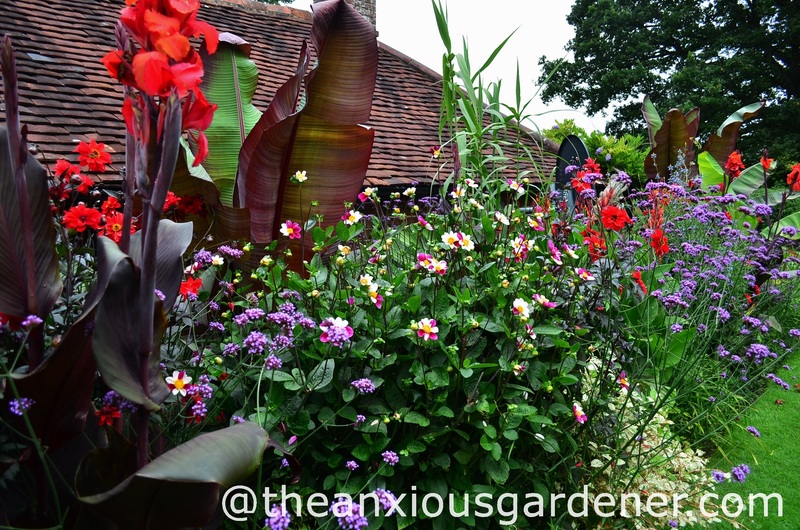 Looking fantastic, such a great range of foliage of varying shapes and shades, and lots of vibrant flowers to add the icing to the border, as it were. Big and bold and brilliant indeed. You should be very pleased. 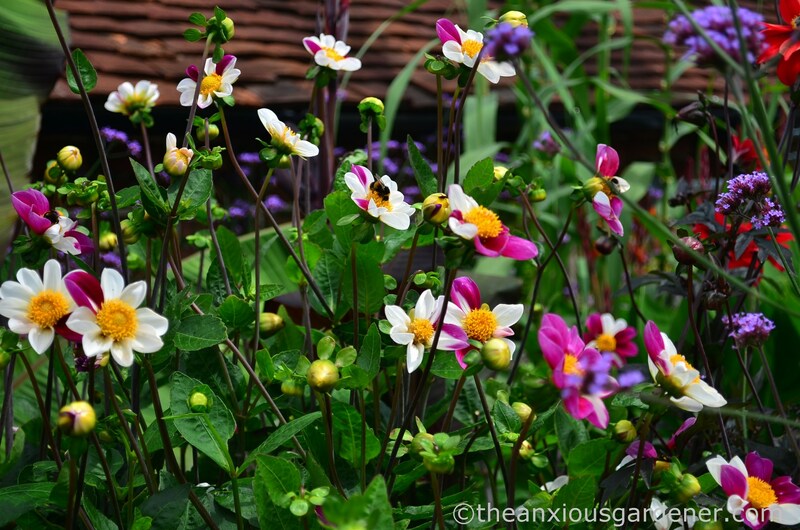 I had my eye on acquiring Dahlia Smartie this year – and a replacement for my sadly missed Twynings After Eight – but then we were a bit distracted and I missed the window for ordering up any new dahlias. Maybe next year… ?! I may scrap all my plans and just copy yours, although I’m missing the magic compost which seems to bring on so many of the good results. Your work has paid off handsomely. Absolutely wonderful to behold. Terribly impressive too. I agree about the experimentation. Nothing like trying new things out, and if they don’t work it’s not a disaster, it just makes room for a different experiment the following year. Well worth all the hard work of lifting and replanting, something I think only professional gardeners can be bothered to do. 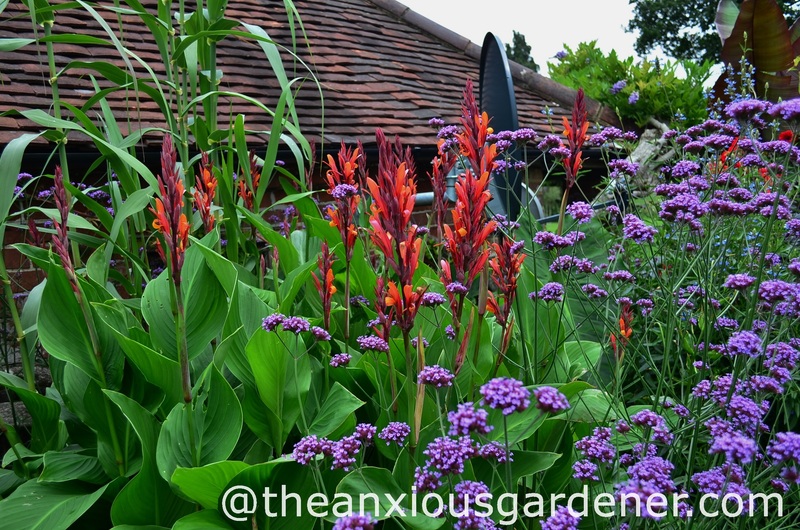 The Canna is great, I have it too but it only grows to about a metre and a half in my dry soil.I’m with you regarding the lily beetles, they are disgusting and take away completely from the pleasure of the lilies. This is a showstopper! 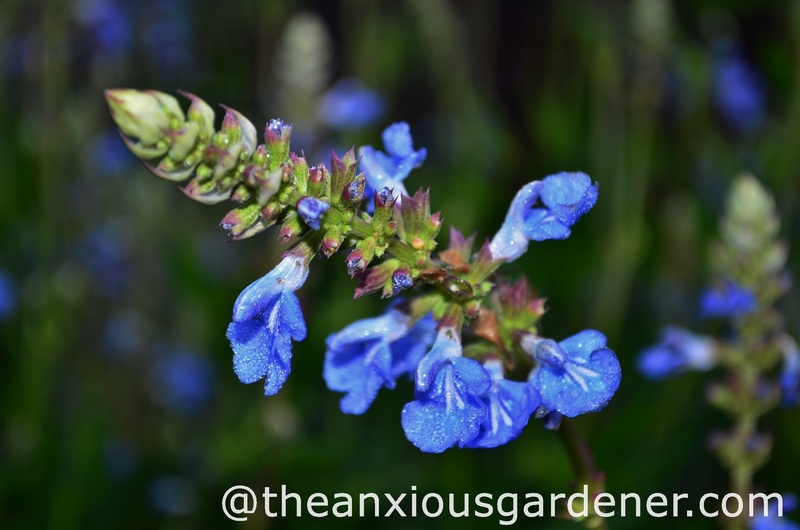 What is your mulch and your underlying soil, when you lift at the end of the season do you wrap the Salvia uliginosa or just place in a pot then in the cold frame? I haven’t grown it before and have no explanation but would very much like too! 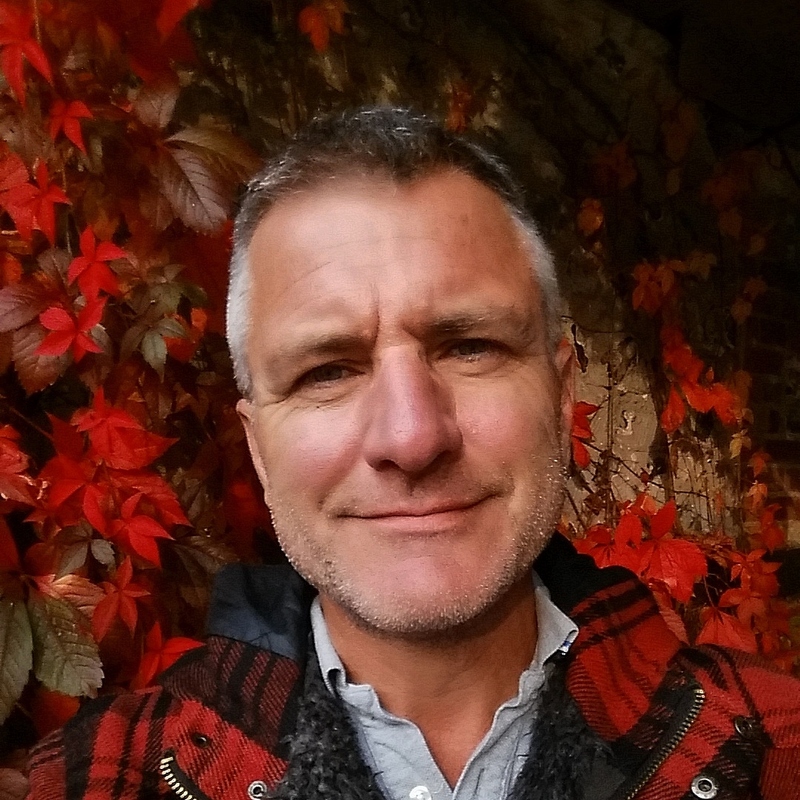 It looks fabulous David, with all those hot colours and beautiful foliage! 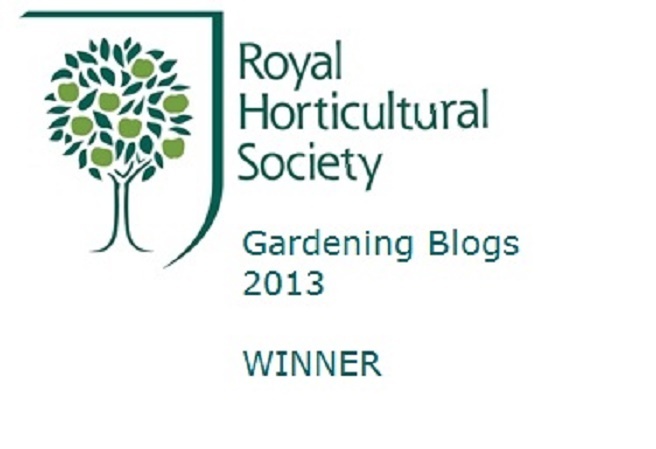 Totally amazing – showing your prowess as a pretty darned good gardener. Well done you for pulling it off. It looks fabulous, Dave! So lush and beautifully proportioned. 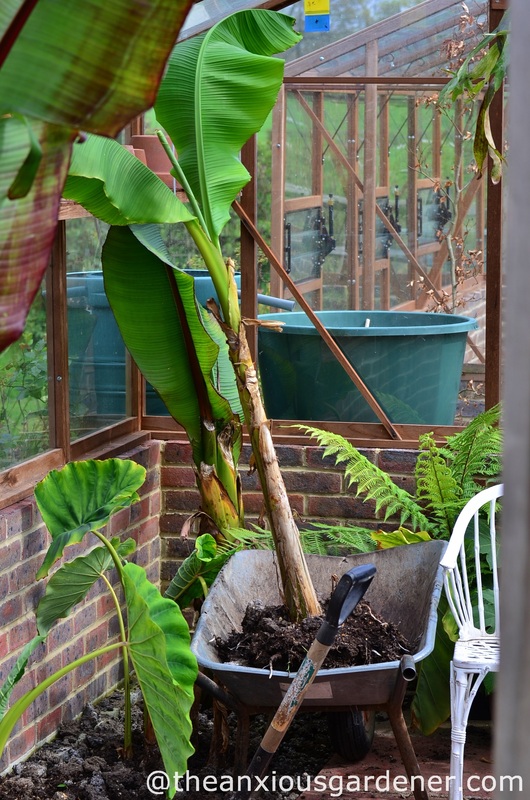 What a good thing you now have two greenhouses — one for you and one for the banana. 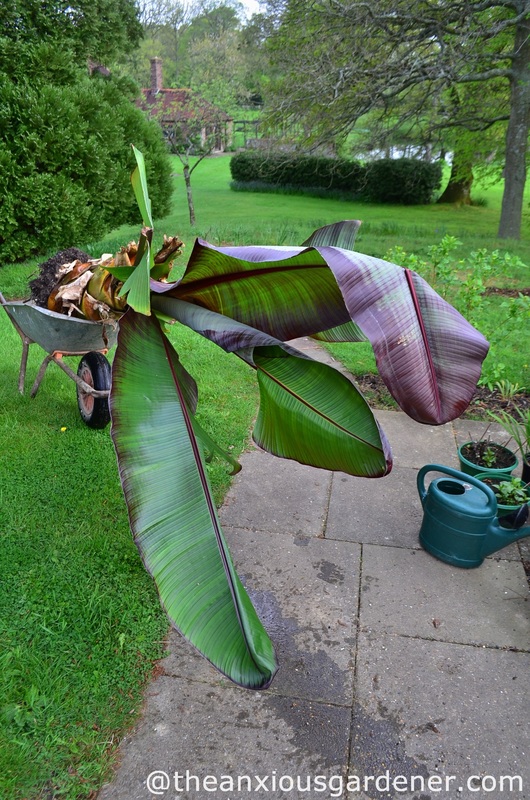 Cannas were new to me when I moved here (Vermont not being a great place for tropical plants), but I’ve mostly seen them in municipal plantings where they’re a little … sad. Not the exuberant party monsters you have there. Hi Stacy, yes. I know what you mean re cannas. 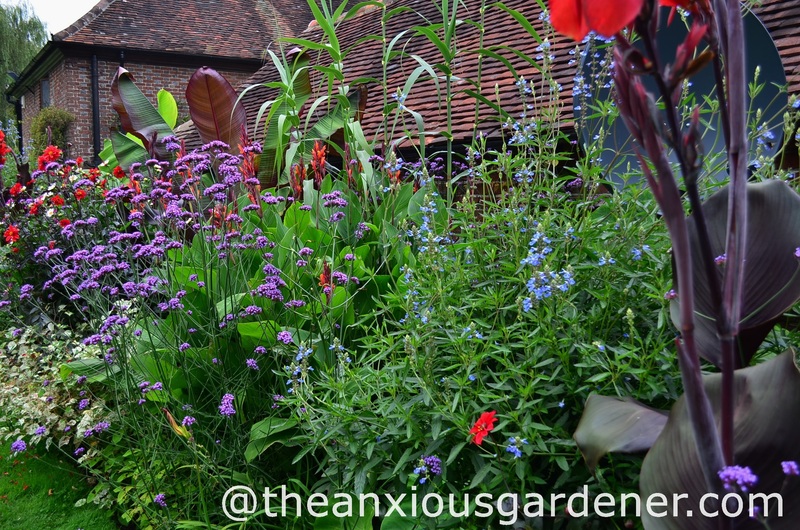 I’m not keen on many of them but they can lift a border, I think and especially if they have good foliage. But the C. coccinea is a real star – pleased I found it. 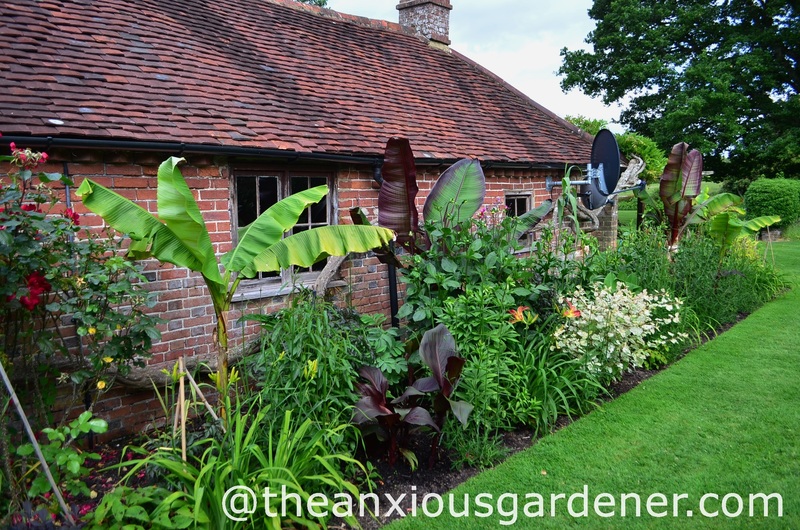 Actually, I share a greenhouse with most of the bananas and tropical stuff. Otherwise who would I talk to through those long winter months? Dave. 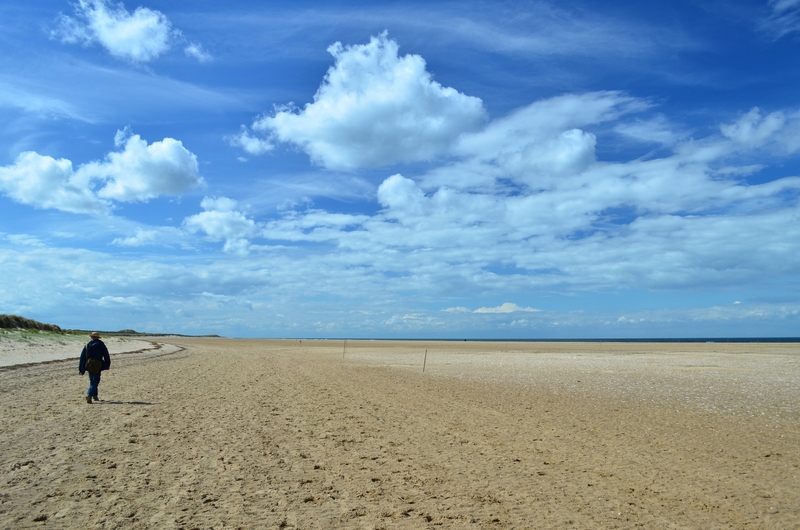 Wow Dave, that is one border to be proud of. All your hard work earlier thus year really paid off. 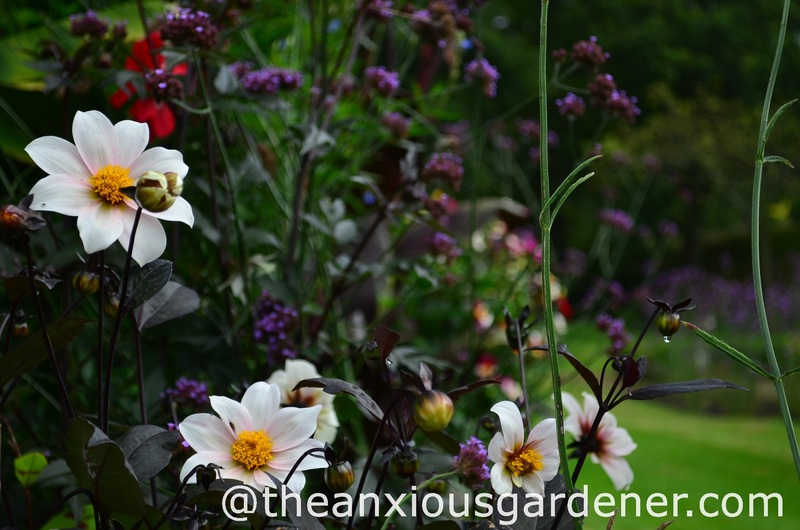 What a gorgeous border, I love the detailed thought that went into the plant selection and design.